The Island Cruises Day Charter provides guests with the unique opportunity of enjoying the sights of Koh Tao from a board an Island Cruises Sailing Yacht. Guests are given the option of Sailing to 1 of the gorgeous bays on Koh Tao where it is possible to experience some of the great marine life Koh Tao has to offer, with a set of Island Cruises snorkeling equipment. Or we can just set sails and let the tropical winds carry us away into the blue horizon. Aboard you will enjoy a Thai buffet lunch provided by Island Cruises, soak up the sun and enjoy the best there is on sailing in Thailand. Although yacht charters are offered daily, they subject to availability of space and/or the desired yacht. 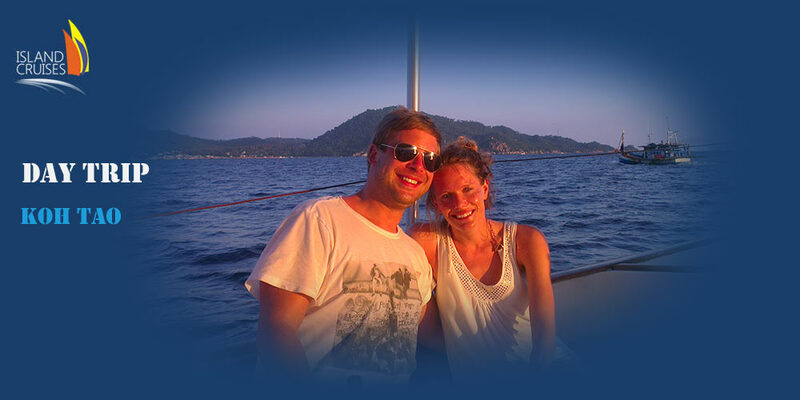 Kick back and relax while we set the sails to cruise the pristine turquoise waters of Koh Tao or try a turn on the helm. After a day of great food, snorkeling, swimming and fun, we will slowly sail back to where our taxi awaits us, to bring you back to your accommodation on Koh Tao. Please see our wine list here! THB 23.000 Price valid for up to 6 guests. Freedom Fargo is registered for up to 20 guests. However, for a full day charter we do not recommend more than 12 participants. For every person more than 6 a surcharge of 1500 THB / person applies. Live Aboard Thailand | Sailing Courses | The Freedom Fargo| Sailing in Thailand| Segeln Thailand | Adventure Sailing Cruises | Yachtcharter Boote Thailand Find more Information about sailing liveaboard in Thailand here: Sailing Cruises & Live aboard in Thailand. If you would like more details about sailing cruises in Thailand, please don’t hesitate to contact us here. Joy and Alc made our day aboard the Freedom Fargo an absolute pleasure. It was our last full day on the island and, to us, it was the perfect send off. Thanks, guys. We had a great time.